There is no denying the culinary cult that surrounds authentic Mexican tamales. They are sought after and savored like nobody’s business. We just happen to have Susy Lara “in da house”, and she has agreed to show us how it’s done. No foolin’ around, this lady is seriously good at the art of the tamale. 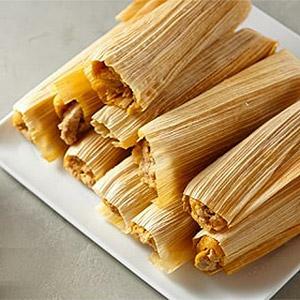 In case you didn’t know, tamales are incredibly versatile… they can be breakfast, lunch, dinner, dessert, or appetizer. They can be made with meat, cheese, fruit, or any combination thereof, and served with any number of sauces. Tonight, our tamale expert will share coveted family recipes, secrets and techniques as she teaches you how to make Chicken Tamales with Tomatillo Sauce. She’ll have you rolling like a pro in no time! You’ll also learn to make accompaniments like perfect Mexican Rice, Pico de Gallo and Homemade Tortilla Chips. We’ll celebrate our tamale-making success with the perfect south-of-the-border libation … a CCKC Signature Margarita! Come be part of the fun in this full 'hands-on' class as we learn all about the fantastically versatile (AND easy-to-freeze) tamale! And here’s a bonus, you’ll even take home a half-dozen tamales to share (or not)! Sat 8/10/19 6:30 - 9:00 p.m. If you plan to attend this class with another party who signed up separately, please add their name(s) to the INSTRUCTIONS /COMMENTS section of your online registration so that we can seat you together; otherwise we cannot ensure that you will be seated together for the class. If you register for multiple students at one time, that registration will prompt you to supply the names of all students you are registering and we will know to seat you together. Thank you!